In Poland are organized two dairy cattle exhibitions at the national level every year and more than 20 regional dairy shows. One of the biggest national exhibition is the All- Poland Dairy Show. Already in 2004 the Board of Directors of Polish Federation showed the initiative to organize in different places of our country the shows with focus on the dairy cattle promotion. The formula “moveable show” enables the breeders, for whom repeatedly the distance to the show area precluded from participating in national show in Poznan, to present their achievements in the national forum. It was accepted, that The All-Poland Dairy Show will take place every year in different region of the country and that the region, which is the host of the show, is allowed to present animals in the amount of 50 % of total number of available stands. The Polish Federation of Cattle Breeders and Dairy Farmers is the main organizer of these shows. The first All-Poland Dairy Show took place in Szepietowo (Podlaskie voivodeship) in the end of June 2005, achieving a spectacular success. It was an encouragement for the breeders to organize next this kind of shows. On 12-13 May, VII. All- Poland Dairy Show took place in Sielinko (Wielkopolska district). Already for second time Sielinko hosted 52 dairy cattle breeders from the whole of Poland. We could admire Polish breeding achievements, including: 85 heifers and 75 cows. Exposed animals represented four dairy breeds: Polish Holstein, Jersey, Simmental and Red Polish. Mr. Erik Hansen from Danish Holstein Association was the primary judge. He worked in the ring accompanied by two Polish classifiers: Piotr Kowol and Roman Januszewski. Judge team awarded 15 titles of champions, 14 titles of reserve champions. From champion group, they awarded 3 honorary titles of “Super Champion of the Show”: one for the best Holstein cow, one for the best Holstein heifer and one for the best other breed cow. 11-14 September 2011, XXV National Animal Breeding Exhibition was organized in Pozna�. The Polish Federation of Cattle Breeders and Dairy Farmers was responsible for dairy cattle exposition. This year 180 animals were presented including 94 cows and 86 heifers. Exposed animals represented the following dairy breeds: Polish Holstein, Jersey, Simmental, Red Polish and Montbeliarde. Exhibition attracted 54 dairy cattle breeders from the whole area of Poland. 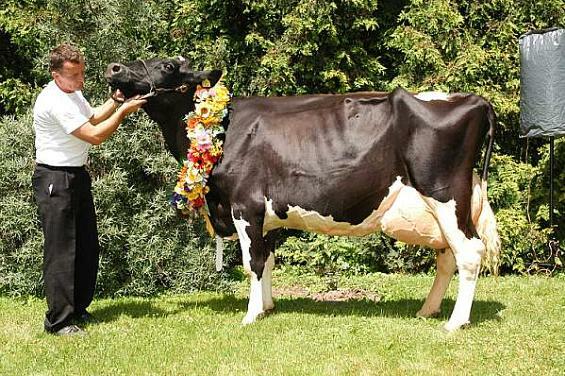 In the last weekend of June 2010 Szepietowo hosted All-Poland Dairy Show for the second time. This time it was the sixth edition of All-Poland Dairy Show. Every year, in the beginning of October a National Animal Breeding Exhibition is organized in Pozna� (Wielkopolska area). The exhibition takes place on Pozna� International Fair area, in the city center. This is a very big event for Polish breeders. Not only dairy cattle but also beef cattle, horses, fur animals, many species of poultry, goats, sheep are shown in this exhibition. 28-31 October 2010, for the second time Italian Cremona organized All European Holstein and Red Holstein Championship. The first European show took place in Paris in 1989, Cremona hosted the Championship in 1991. The competition between the best European cows was then held annually and, later, every second year in different locations across Europe.